Spring is trying to creep in to the most southern city in the world, so it was time to start exploring more, starting with a weekend trip. 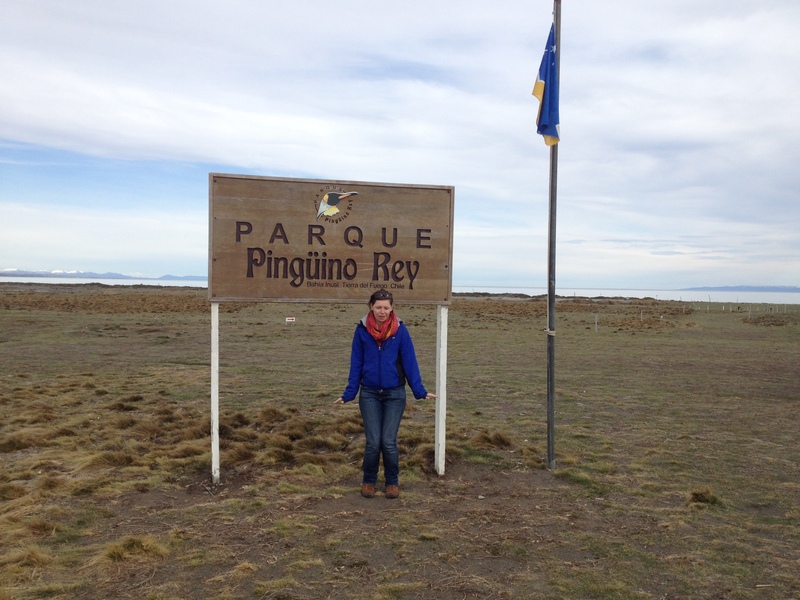 I hopped over the Strait of Magallanes to go see some king penguins, and spend some time with a Chilean family in the town of Porvenir. There is only one return ferry a day – one to Porvenir in the morning and then one back to Punta Arenas in the afternoon. 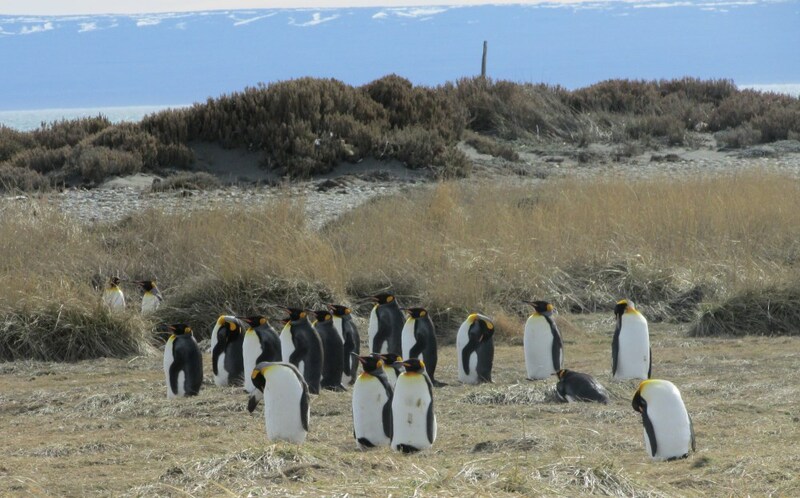 So if you want to see the king penguins your choice is either stay the night or drive a very long way back. I didn’t fancy a day of mostly driving stuck in a bus with tourists, so I opted for staying the night. I went with some teachers from school who have family in Porvenir so I had a mini Chilean homestay for the weekend. This meant I got to spend time with a Chilean family, practice some Spanish, eat lots of food and enjoy the feel of a new town. At the end of the world, stars mean penguins! And they are just adorable. I swapped my Saturday lie-in for an early wake up call – I didn’t want to miss the only ferry! It was a nice crossing, calm water with some nice views and fresh air. An orchestra tour on board meant a violinist could be heard, which was lovely until he started playing the titanic music! For most of the ride over the town of Porvenir was hidden from view in the bay, which means you can’t see Punta Arenas once you’re there either. But you can work out where the big city is from the Andino ski hill – lots of white paths cutting through the forest on a hill are pretty distinctive. Only seeing the countryside around you gives Porvenir a feeling of being even more isolated than it already is. Once we arrived we met the family, settled in to the house and got chatting. And eating. Throughout the whole weekend there were numerous sit-down meals and tea breaks so I wasn’t going to go hungry! But this didn’t matter too much, as we could could work out going there tomorrow. I enjoyed a wonderful sunny (…dare I say warm?!) day chatting with Chileans and enjoying a little driving tour around the town and to some viewpoints. The whole place was beautifully tranquil, both from the hill across the bay and the balcony in town. The only thing to break the silence was the occasional rally car. There are some great views of the town, across the bay, where we went for a little off-road drive and then wandered up a hill. I’m always happy when I’m outside running around green space so the view was just a bonus for me! We went for a trip to the museum, which was small but interesting. It was the perfect size to fit my attention span for museums, as I get bored of reading lots of information. The displays ranged from stuffed animals to a reconstructed old-fashioned shop, with all sorts in between – old cameras, indigenous tribes and even a mummy! If your travelling companion scrutinises every detail and you’ve just whizzed through, then I recommend the hidden reading corner up the stairs! The evening was relaxed with an incredible sunset. Tomorrow we were going to see the penguins! Another early morning to get there before the road closed for the rally, and then hopefully get back too. It’s an hour and a half drive from Porvenir and with clear skies and the morning sunlight it was stunning. On one side you’ve got snow-capped mountains across the strait, and on the other is what I can only describe as bumbling hills. Rolling hills imply something far smoother than these tumbling things! Amongst all of that were various animals – mostly sheep (boooooring!) and guanacos (awesome llama type creatures!). When a group was hovering by the water, I was secretly hoping one would get pushed in. Partly because I wanted to see them in the water, but mostly because it would’ve been funny. Their necks must have springs instead of bone, because they make some funny contortions. A few were lying on their belly, looking like a beached whale. Like they fell over and can’t be bothered getting back up, so they just move their head to look around. The penguins getting up was like balancing magic but lying down was the funniest. If you’re ever seen the Pixar film Inside Out then you’ll understand. Watching a king penguin lying down is like Sadness when she becomes really sad and kinda slowly flops down on the floor. And the best thing has to be their wobbly walk – what’s not to love?! Waddle, wobble, waddle, trip, waddle. 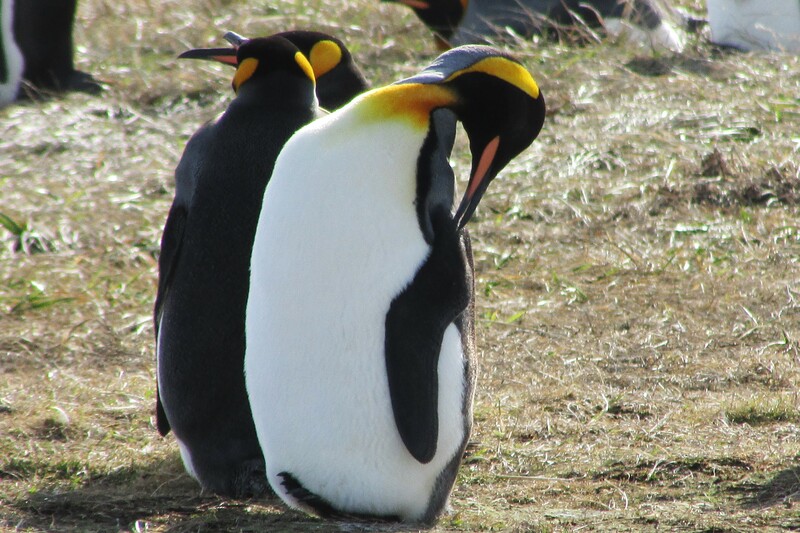 These penguins are known for their yellow details, and at one point the whole group decided to turn their back on us. They look like they’re wearing those earwarmers in a bright yellow. The bright colour is just incredible! There was one brown fluffy one that was like a puffball. Some penguins had smooth fur, and others had little scruffs that made them look like they were wearing tattered jackets. Everything about the penguins are fascinating but funny. They’re peculiar creatures and I’m excited to see more of them. When my mum visits me in December we’ll be going to see the Magallanic penguins – smaller ones that live on an island and you can get much closer to them. We didn’t get past the start of the rally in time, which meant we had to wait for it to go past before we could get back to Porvenir. To be perfectly honest, this suited me just fine! 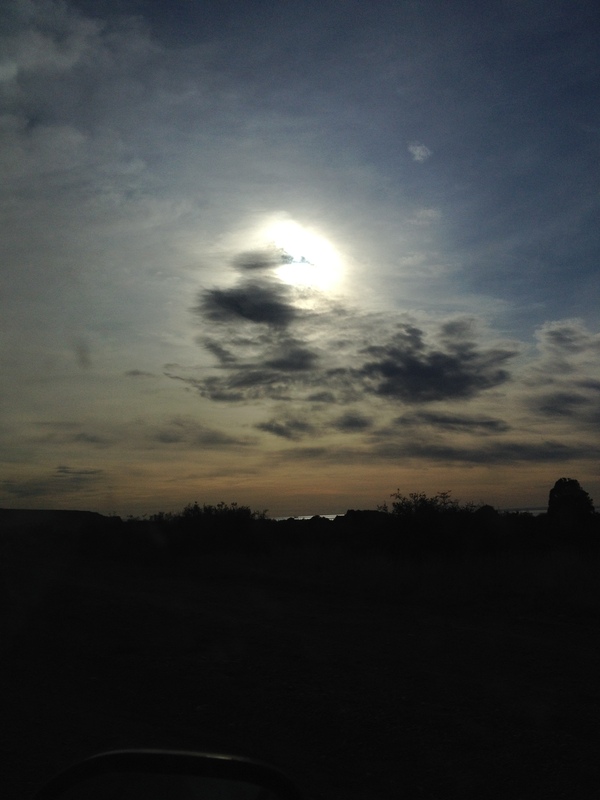 We were in the middle of nowhere with the sun shining, calmness all around and I had my book – what more did I need? I spent 3 hours wandering around, reading my book and watching the car rally. By the time the last car had gone past there was quite a queue at the inersection! The drive back was more of the gorgeous scenery and then another tea break with the family before heading to get the return ferry. 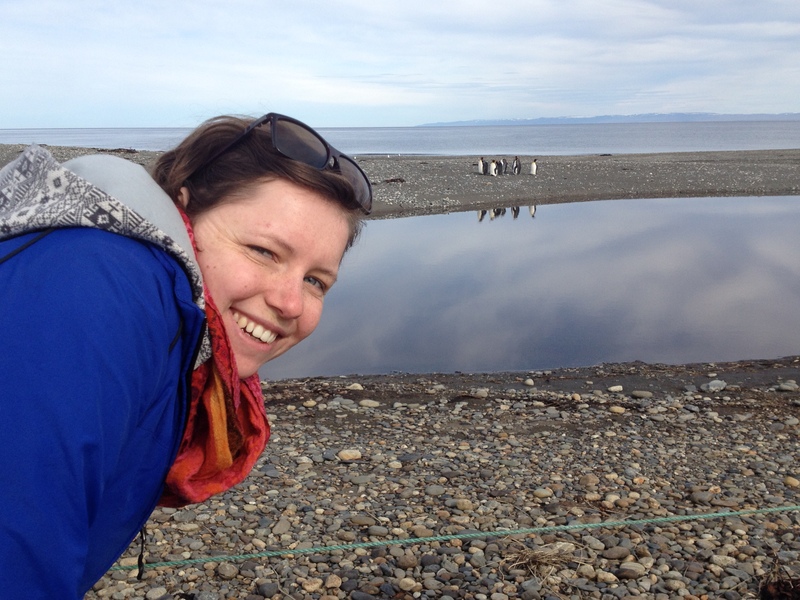 The bonus of visiting the penguin colony early in the morning is that we were the only people there so it was really peaceful. Just you, the strange wheezy squawk of some penguins and the sunshine. 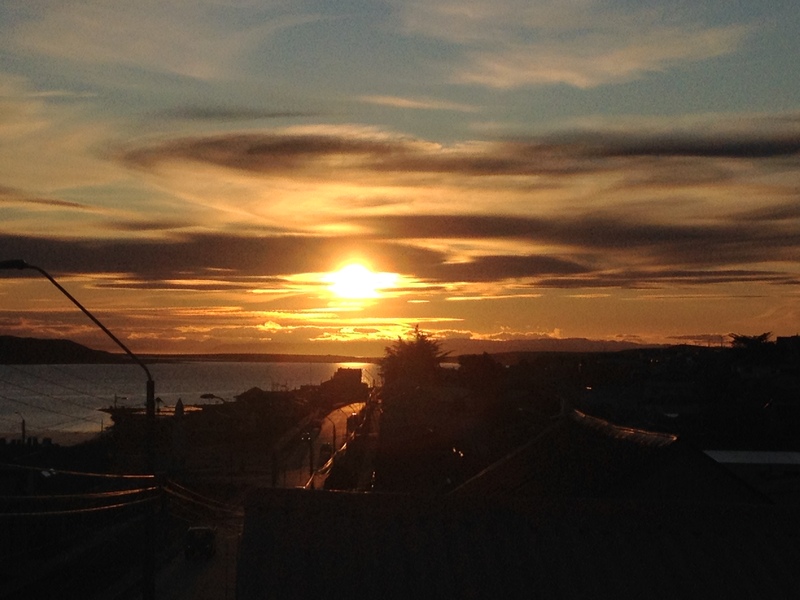 I definitely wouldn’t have wanted to do this as a day tour because it would have taken forever to get back to Punta Arenas the long way round, and because part of the joy was how quiet it all was and that we could move around to get the best view.